Weed eaters for kids are surprisingly fun gifts for curious young ones. One thing about children is that they’re always determined to mimic their parents by pretending to do things that are actually not real. Knowing how a child’s brain works is very essential for parents. Their curiosity and desire to understand the world around them paves way for the need to purchase weed eaters for kids. 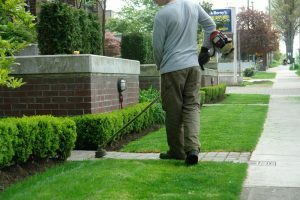 Although weed eaters for kids are not very common on the market, we have managed to stumble upon three of the best weed eaters available. Let’s take a look at each one of them. The Husqvarna Toy Trimmer is the leading toy trimmer in the market. This toy is made of hard plastic which endures the wear and tear which your child may place upon it. Designed for kids aged 3 years and above, this toy includes 3 AA batteries which offer a long runtime. The coolest thing about this toy trimmer is that it’s capable of producing sounds similar to a real weed eater. When you pull the trigger, green LEDs light up in a rotating motion imitating a rotating cutter. The light weight of 1.6 pounds means that this toy can be handled by any kid ranging from 3 years and above. This toy trimmer has adjustable nuts on the frame making it ideal for short and tall kids. This toy makes noise when the trigger is pressed. This function makes it realistic for most kids. The plastic cutter is designed in a way that it can’t hurt your kid when spinning. The 3 AA batteries offer a longer runtime saving the cost of having to buy new batteries every time. Some customers have complained about the dimensions of this toy trimmer stating that it’s quite small for taller kids. The motor has a lot of complications and some customers have complained that it stopped working after some time. All in all, the Husqvarna Toy Trimmer is the best choice for parents looking to impress their kids. According to most reviews, this trimmer has great features which include an adjustable frame, a hard plastic construction, a rotating LED cutter and powerful 3 AA batteries. The John Deere Power Trimmer is a unique toy weed eater in its own way. Instead of using batteries, this toy takes advantage of the starter cord which powers the motor to rotate the translucent bottom. The bottom contains colored balls which rotate, thus impressing your child. The John Deere Power Trimmer is suitable for kids 18 months old and over. Its solid plastic design makes it tough and unable to break easily. When you pull the cord, the trimmer produces sounds of real weed eaters giving your child a real life experience. One lifetime advantage with this toy trimmer is that you don’t need to purchase any batteries. Designed with bright yellow and green colors, the John Deere Power Trimmer is the best cure for curious tots aged 18 months to 4 years. This toy trimmer is surprisingly light (1.3 pounds) making it perfect for younger kids. This toy doesn’t use any batteries for its operation. The cord design is very friendly to most kids as they enjoy pulling it around. This toy trimmer produces a real trimmer’s sound which is again great for young kids. This toy trimmer doesn’t have additional features such as lights and extra sounds as compared to the Husqvarna Toy Trimmer. Kids who are too young to use the start cord will not enjoy using this toy. Ertl is among the most respected companies when it comes to designing cool toys for young kids. The John Deere Power Trimmer is one among the coolest toys made by the company. Its elegant design and smart features such as the starter cord and rotating colored balls have made all kids enjoy their company with the toy. The Home Depot Weed Trimmer is a realistic toy which introduces young kids to the world of toys. With the press of a button, this toy tool starts the engine and lights up, producing different sounds which signals young “workers” to commence work. The Home Depot Weed Trimmer is battery powered. It has a solid outer construction which makes it perfect for kids aged 5-7 years. 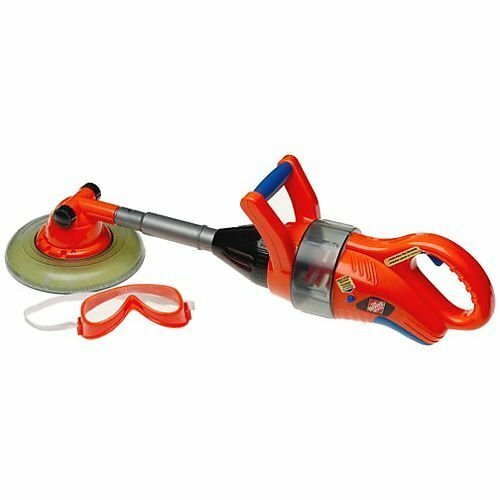 This toy comes with various attachments such as toy trimmers, toy chain saws and other power tools which give young kids a real life experience. Other than that, this toy has a very light weight of 2.4 pounds meaning your kids will never get tired of using it. These toy weed eaters are available at a very cheap price. They come with various attachments which gives your kid a variety of options when operating. They’re light weight and thus suitable for kids ranging from 2½ years. This toy is made from cheap plastic material which breaks easily. Most customers have complained about the fan and the LED lights stating that they stopped working after 24 hours of play time. 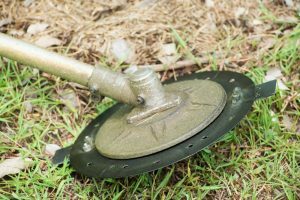 Although the Home Depot Weed Trimmer has faced a lot of criticism from most customers, the overall performance of this toy is just phenomenal. Available with different attachments, this toy can do a lot more compared to other pricey toy tools. With the advantage of batteries which power up the LED lights and the sound system, kids can’t wait to add this toy to their toy chests. 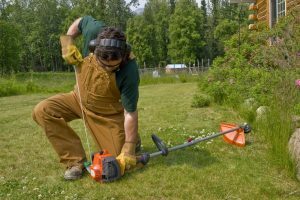 After thorough reviews of some of the best kids weed eaters, the Husqvarna Toy Trimmer was by far the best in the category. Designed with hard plastic which resists wear and tear, this toy tool uses 3 AA batteries for effective operation. When your kid pulls the trigger, multiple trimmer sounds and green LEDs lights up showing you it’s time to commence work. This toy trimmer has a stylish outer casing which impresses most kids on first sight. 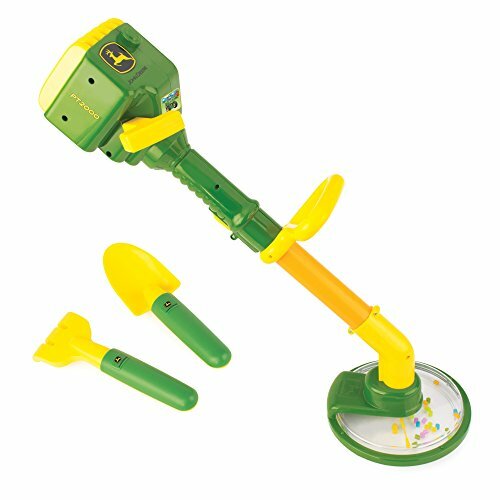 Second in the category, we reviewed the John Deere Power Trimmer which is another unique toy tool for kids. Unlike other toys which use batteries, this toy relies on a starter cord which powers the motor to rotate the cutter. The bottom has a translucent cover and colored balls which imitate the cutter. Designed with a light weight of 1.3 pounds, this toy is the best for kids 18 months to 4 years old. Last in the category, we reviewed the Home Depot Weed Trimmer. This toy trimmer is designed with a hard outer plastic casing which is colored to impress your kids. With the press of a button, this toy is capable of producing sounds and lights which signals your kids it’s time to commence work. This toy comes with multiple attachments which impress your kids even more. With a light weight of 2.4 pounds, this toy is perfect for kids 5 to 7 years old.